Do you qualify for a Free Boiler in Newcastle-Upon-Tyne? If you rent your home, please contact your landlord, your local authority and your energy company as other grants may be available. Please note that if air bricks are installed at ground level in your external walls, your home will have suspended wooden floors. You must receive at least one of these benefits to qualify for a boiler grant but please see the notes below. If any of the following information cannot be easily obtained from the outside casing of your boiler or from any documentation you may have, please DO NOT attempt to dismantle any part of your central heating system to obtain it. Make of the central heating boiler? Would you also like to apply for a cavity wall insulation grant or a loft insulation grant? If your home has cavity walls but no cavity wall insulation you may qualify for a Cavity Wall Insulation Grant. If you have less than 100 mm of insulation in your loft you may qualify for a Loft Insulation Grant. In an effort to remedy both of these problems the Government launched the ECO Scheme (Energy Companies Obligation) in January 2103. The Affordable Warmth Scheme is part of ECO. A new ECO scheme started on 1st April 2017 which offers boiler grants and storage heater grants to low income households who receive means-tested State Benefits. Boiler Grants provide funding for qualifying householders to replace old, faulty and inefficient central heating boilers with new modern energy efficient A rated boilers. 1. You must live in your own home or one you rent from a private landlord. Different rules apply to householders in social housing (council and housing association properties). Guaranteed Pension Credit (Savings Credit and ordinary State Pension do NOT qualify on their own). 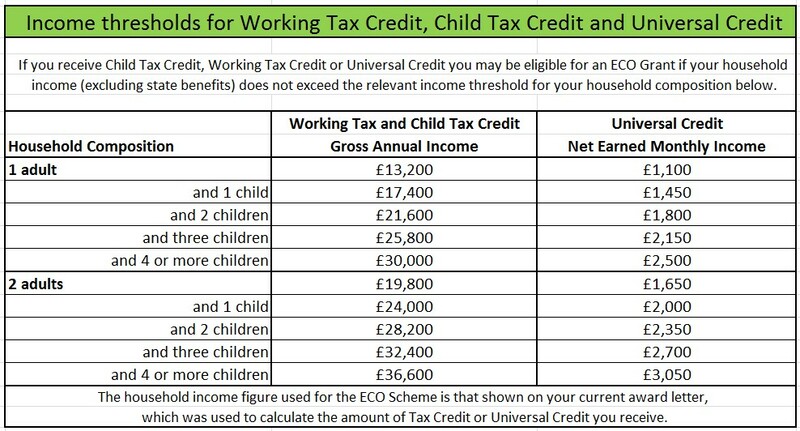 * Maximum household income thresholds (based on the number of adults and children who live in your home) apply to these State Benefits and these can be found in the table below. 3. You must have a central heating boiler installed in your home which is both inefficient and faulty OR is faulty and would cost more to repair than to replace. Once you have completed the Boiler Grant Application Form we will call you back to discuss your application. If you qualify, you will be referred to a local ECO Scheme approved boiler installation company. They will arrange a free survey of your heating system and officially apply for a boiler grant on your behalf. They should be able to immediately tell householders whether they qualify for a free boiler in Newcastle-upon-Tyne or not. Once your application for ECO funding to replace your boiler has been approved, a date will be arranged for the installation. 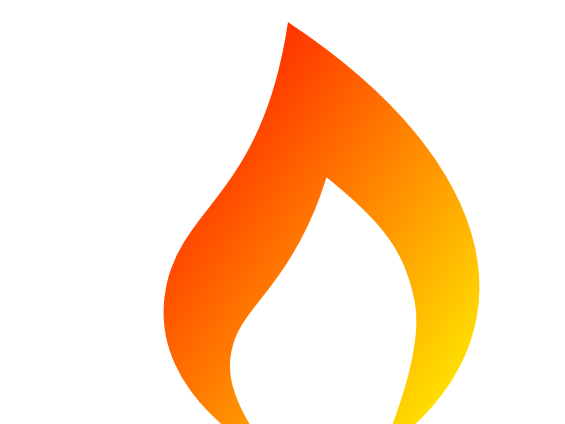 The Affordable Warmth Scheme website was launched at the same time as the Government’s ECO Affordable Warmth Scheme itself, back in January 2013. We work closely with a national network of ECO Approved boiler installation companies who have been awarded Affordable Warmth Scheme Boiler Grant funding. Once we have confirmed that you satisfy the Affordable Warmth Scheme Boiler Grant qualifying criteria we will refer your enquiry to an ECO Approved installer. Householders will be advised whether they qualify for a free boiler in Newcastle-upon-Tyne or whether a contribution to the cost is required. In addition to applying for a free boiler in Newcastle-upon-Tyne, you can apply for a free boiler in Middlesbrough, a free boiler in Sunderland, a free boiler in Durham, a free boiler in Gateshead, a free boiler in South Shields, a free boiler in Hartlepool, a free boiler in Darlington, a free boiler in Stockton-on-Tees, a free boiler in Consett, a free boiler in Bishop Auckland, a free boiler in Tynemouth, a free boiler in Morpeth, a free boiler in Washington, a free boiler in York, free boiler in Driffield, free boiler in Malton, free boiler in Pickering, free boiler in Selby, free boiler in Thirsk, free boiler in Scarborough, free boiler in Bridlington, free boiler in Filey, free boiler in Galashiels, free boiler in Selkirk, free boiler in Berwick-Upon-Tweed, free boiler in Kelso, free boiler in Jedburgh, free boiler in Melrose or a free boiler in the North East of England, free boiler in North Yorkshire or a free boiler in South East Scotland.